My student Maria Romo writing about Sovanchan Sorn’s BFA Fiber thesis exhibition this is all I remember, in the School of Art’s Werby Gallery on 12 April 2017. Sovanchan Sorn is originally from Des Moines, Iowa but she was raised in Long Beach, where she has resided her entire life. Sovanchan went to Long Beach City College and transferred to CSULB for her BFA in Fiber Art. She says that she is drawn to anything she can shape and form in her hands. Her objective as a fiber artist student is to push the media she works with into more sculptural art forms and give them meaning. This is all I remember isn’t a typical art gallery installation where the focus mainly relies on artistically alluring pieces that draw attention. The gallery revolves more around the stories that have inspired Sovanchan. 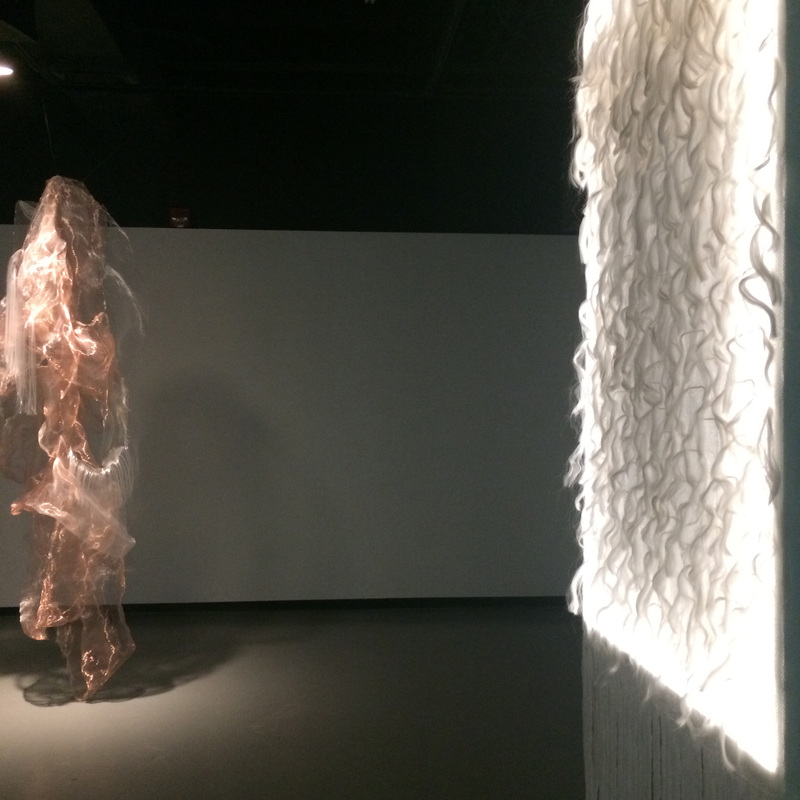 Sovanchan has included two hanging fiber sculptures that are representative of her family and their stories. The first sculpture I want to talk about is the copper and fiber filament sculpture. 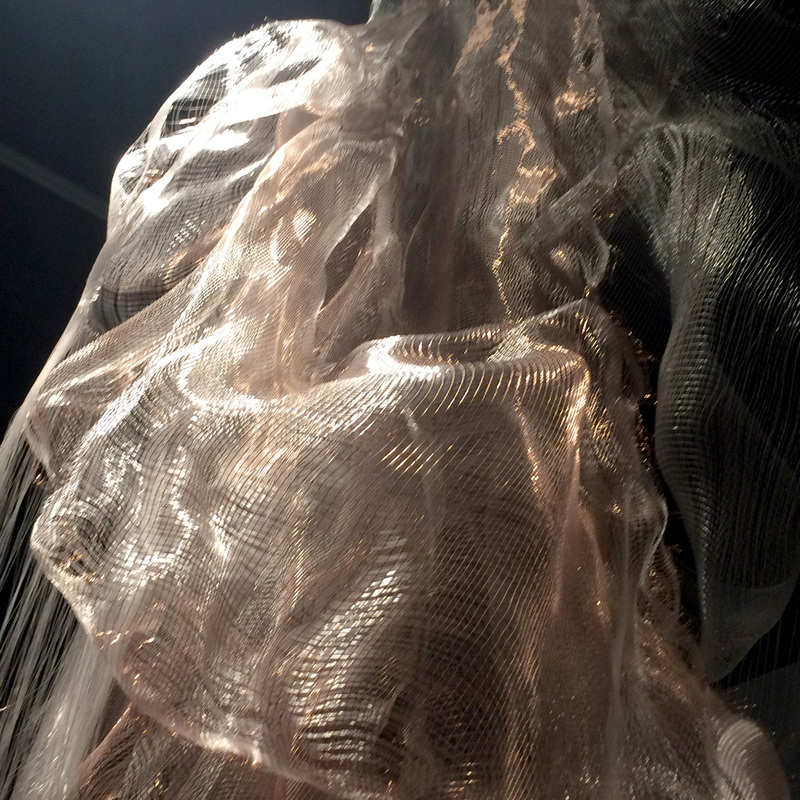 The piece in itself is extremely beautiful in the way the fiber filament hangs and how the copper structures it all. The copper falls down in drapes, seeming to be cloth-like, and the filament falls over the copper like a frame and weaves in and out. The second sculpture piece is a lit up wooden frame, draped in silk. The silk is a cover for the wooden frame inside, structuring the lights that only light up on the edges. The bottom of the piece has frayed silk that hangs softly, waiting for you to run your fingers through it. The back of the board is plain, while the front has many little-frayed edges that curl in loose waves. This is the type of art piece that I would want to have to hang in my room like a headboard, while the other is something that I would expect to see in a gallery in New York. Nonetheless, they are both extremely remarkable art pieces. This gallery was inspired by stories that Sovanchan has gathered from her family. You should know that Sovanchan’s family are survivors of the Pol Pot genocide that happened in Cambodia from May 1925 to April 1998. Her family is just one of the millions that were effected, and one of the hundred-of-thousands that came to America. For most of her life, Sovanchan has tried to get her family to talk about the experience they had as a way to cope with all their demons. This is the first time she had ever heard the stories, and it is also the first time her other family members have ever read each other’s experiences. The main purpose of the whole exhibit is to raise awareness and address the struggles of her family and a whole society that faced genocide. The meaning and concepts in Sovanchan’s installation focus mainly on the stories and experiences of her grandmother, two eldest aunts, and her mom. She has found an elegant and stunning way to physically and metaphorically represent them. I talked earlier about the two hanging sculptures in the gallery and how marvelous their physical art form is, but what makes them more special is how they represent Sovanchan’s family and everyone. When looking at the pieces the materials look extremely thin and fragile, that’s why it is important to take note of what they are made of. The copper that she uses stands for strength, while the fiber filament stands for resilience. Both of these traits are things that Sovanchan has found present in many of the survivor’s stories and personalities. The silk she uses in the second hanging sculpture stands for the softness and finesses that silk is so known for. This trait is one that she has found within the women in her family because of how they carry themselves even after everything that has happened to them. Sovanchan’s exhibit hit me hard. The topics that she has centered her work around are extremely difficult and emotionally wrecking things that many try to avoid talking about. It wasn’t a breath of fresh air to read the women’s experiences. In fact, I felt a heavy dread just knowing the truths they may contain. Two weeks ago, in week 9, I interviewed Dulce Ibarra who’s work was indirectly about the mental disorders of her immigrant family. A couple months ago, I had to edit my “about me” page because I straight up wrote that I am an immigrant. But, here I am again writing it down because after seeing what Sovancha’s family has gone through, and knowing some small aspect of what all those Cambodian refugees experienced, I have realized that I am grateful. I am grateful that I am an immigrant and not a refugee of a mass genocide because the probabilities are that I would not even be alive. Most people use the terms refugee and immigrant interchangeably, and in some cases they are, but in most, they are not. An immigrant is a person who has the choice to leave and relocate permanently in a foreign country. A refugee, however, is someone who is forced to leave their country because of war, persecution, or genocide. I will never know personally what all those people went through, and I would never wish that to happen to even my worst enemy. While I was looking at the sculptures I was fine, but when I started to read the stories I had to hold back tears. It was supremely sad and eye opening all at the same time. All I could keep thinking about was my family and how we are so lucky we didn’t have to experience so many harsh things on the way here. We didn’t even have to wait so long to cross over. Sovanchan’s family waited years. They waited so long just for someone to come and give them food, shelter, give them better jobs so they could raise their children. They waited for the war to end, and when that didn’t look like it was coming, they still kept waiting and suffering through it all. I haven’t even talked yet about what it was like, atmospherically, in the gallery. Sovanchan had audio playing of her family recounting their stories. You can hear them crying while they remember all that they can when they don’t want to. The last piece in the gallery was a projection of the shadows of a slowly turning weaving. It suggested that the traumatic experiences of life never go away, however much we want them to. They are always present.